One of the most crucial aspects of interior design – Layering – is the art of building personality, texture and breathing life into your interiors. 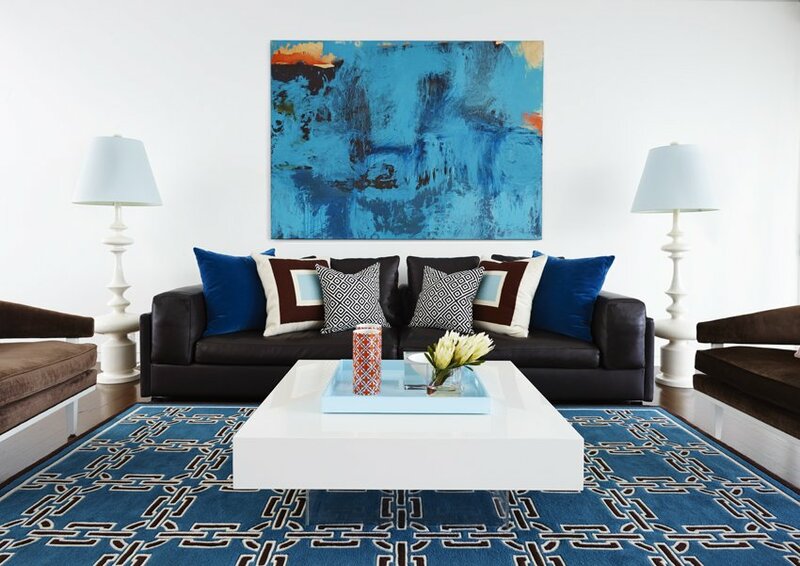 Most people might picture a crazed designer piling throw pillows and furry blankets together in a creative frenzy – though there might be an element of truth to that, layering is much, much more! Let me take you on a virtual tour through the elements involved. 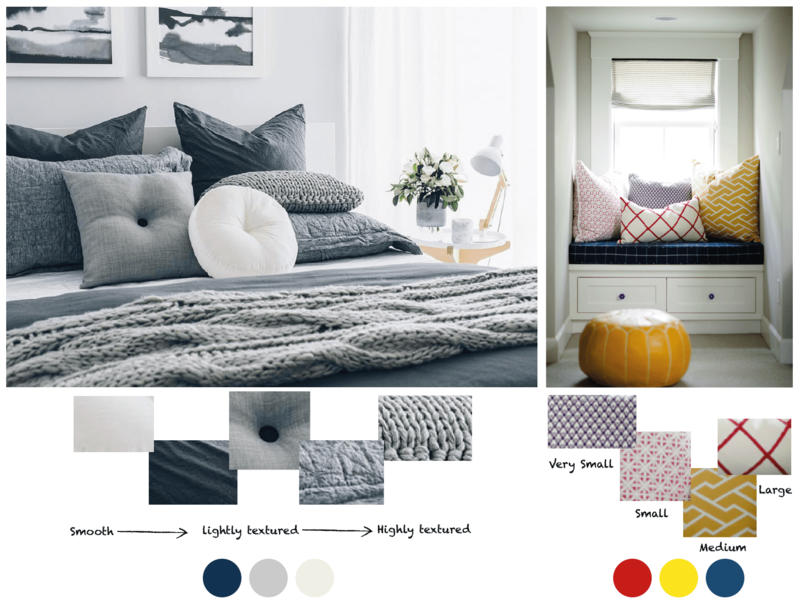 To start off, check out this beautiful design process by Emily Henderson ! 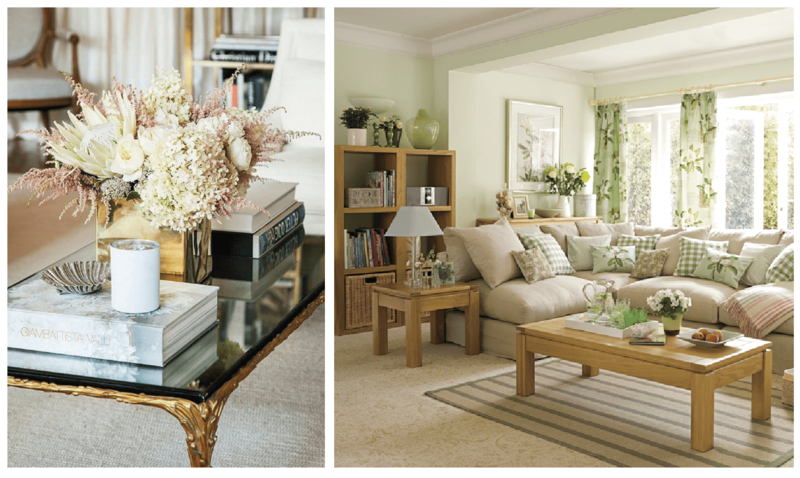 The room simply transforms before your eyes, from an open empty space to a gorgeous, sun-kissed, coastal style, haven. The entire process demonstrates how layering is done. 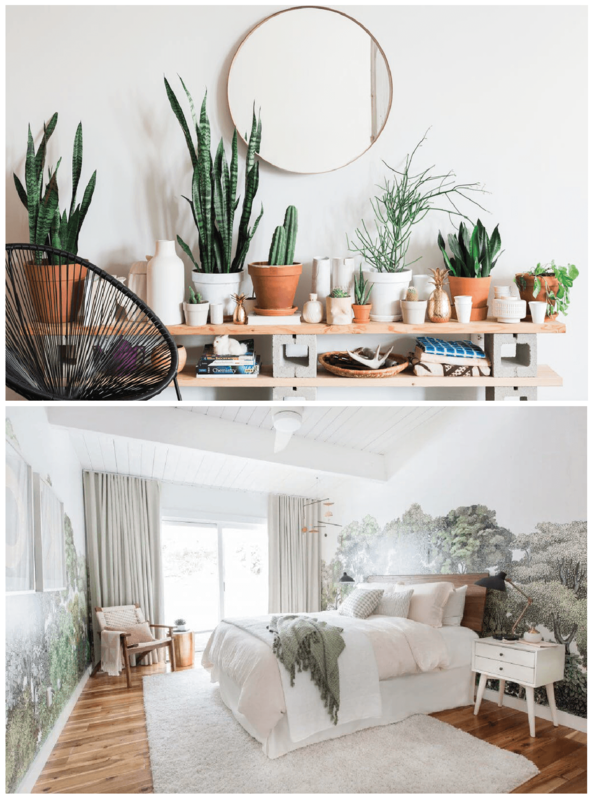 First comes the furniture and carpets, then soft furnishings (pillows, throws, curtains), next is the décor and accessories, and finally the room is topped off with a barrage of green plants and succulents, for that true laid-back vibe. Whilst I’m sure you’re quite up to creating a colour palette, you might need a bit of help applying them to your room. 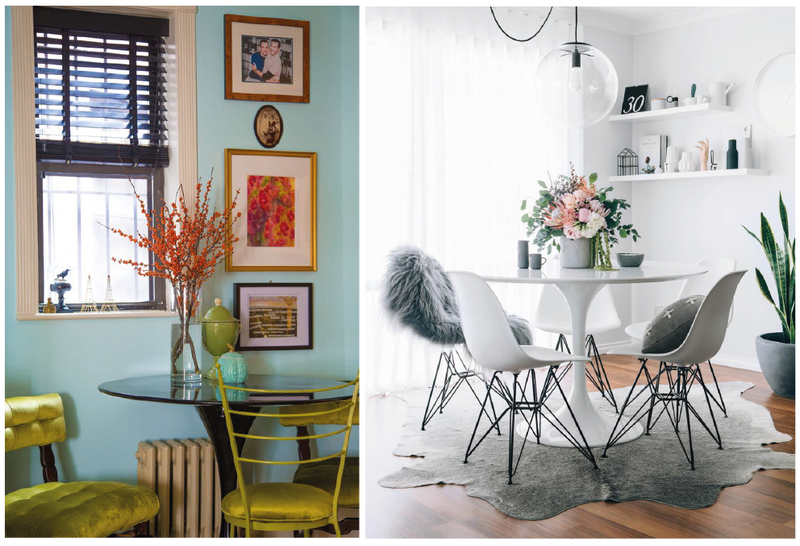 After picking your predominant shades, always pick an accent colour that contrasts beautifully. For example, on the left we see a lovely autumnal combo of yellowish green and pastel blue, accompanied by a bright pop of orange! On the right is a monochrome marvel, with accents of salmon pink and green. Tip: Always follow the ‘rule of twos’ – Each colour should be repeated a minimum of two times in any layout. For example, on the left, orange is repeated in the flowers and the painting on the wall. On your right, the pale peach flowers take centre stage, while the peach accessories on the shelves are more discreet. This repetition is done to ensure colour continuity; if it appeared only once it would stick out like a sore thumb, rather than blending in effortlessly. Mixing different textures are a sure-fire way of adding depth into your interiors; they turn an empty space into a habitable environment. Everything you own has a unique texture – smooth, grainy, furry, reflective etc. Even in nature, you will find different types of texture; this is why humans are inherently attracted to layered, textured spaces. Smooth, basic textures are not originally found in nature; therefore one might feel such an environment to be cold, unwelcoming or hollow. Take your texture and go crazy with it, add it to your walls, floors and furnishings, not everywhere at once though! 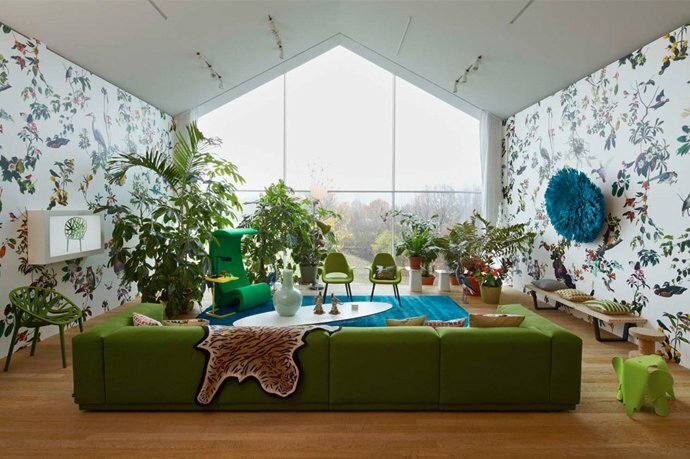 Tip: Plants are a natural type of texture that brings in an element of the outdoors, inside. These so called Biophillic spaces have been known to improve temperament; it’s all about animal instinct at the end of the day! It is essential to layer basis the kind of room you are decorating. In a living room meant to entertain guests, for example – keep out some refreshments (brightly coloured fruits or sweets) in lovely bowls, some lovely scented candles for ambience, a bunch of flowers, and my favourite – Books! These are functional additions, but also help beautify the space. Coffee table books (You might have to judge these books by their covers I’m afraid!) are a source of entertainment, add dimension and can bring a splash of colour to your table. Tip: Some people love picking up beautiful ornate furniture and accessories on a whim. Don’t buy something solely on the basis of looks. Ensure that the piece is well suited to the kind of room it is to be a part of! Have you ever noticed the harsh white glare found in hospitals and car showrooms? That clinical, cold atmosphere is due to the fact that these open spaces make do with basic lighting solutions like recessed lighting or pendants that give an even, unflattering illumination. 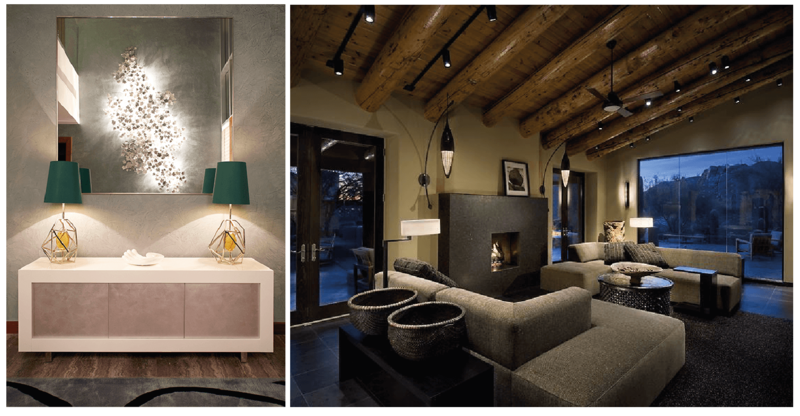 Introducing decorative lighting pendants, table lamps, floor lamps and wall sconces can go a long way by painting your interiors in a more flattering light. With different sources throwing light in all directions, the room is charged with a gorgeous play of light and shadow! Tip: Place floor lamps in dark corners to brighten them up, wall sconces look best in hallways and places where you could play up the element of symmetry. Switch them all on, or alternate – every time you do, watch your room channel a new atmosphere! When it comes to choosing throw cushions, even the pros have trouble picking the perfect blend of sizes, patterns and textures. I’m going to try and simplify it for you! First, observe the patterns on the right. It’s easy to see that each of them is set in different sizes. It is your job to ensure that patterns of the same size aren’t found within the same arrangement! This ensures a clash, leaving the arrangement displeasing to the eye. On your left you see a perfect blend of textures – from smooth, to button-tufted, to creased, and finally a solid wool weave! Here, the smoother textures are found aplenty, while the coarser ones are fewer in number. By inserting more solid tone/smooth cushions into the mix, the flurry of activity from vibrant patterns or more textured materials gets balanced out. Tip: If the patterns are vertical, horizontal, floral, cross-hatch or illustrative – it doesn’t matter, in fact, the more the merrier! You need to use your colours to tie them together – pick a colour palette and stick to it! Layering is all about balance at the end of the day – Balancing colour, patterns, and the spatial layout of your items. There is no cookie cutter version of the layering process; it is all a blend of trial and error, and sometimes just pure, brazen luck! It becomes easier the more you experiment and take inspiration from famous designers, design magazines and everybody’s go-to design guru – Pinterest! This entry was posted in Fabiia Ideas, Inspiration, Interior Design and tagged Inspiration.